This black pillar candle stands 7 inches tall and is 1 and 1/2 inches in diameter. It has been energetically charged by an experienced practitioner to help increase protection in any way, shape, or form. This ritual candle may help establish a comfort zone, energy field, or aura around that which is in need of protection. 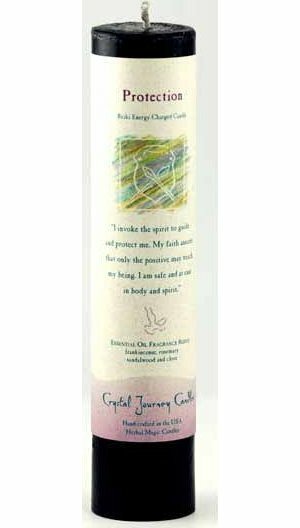 The Protection Reiki candle is a potent tool for increasing protection energy on it's own or by further empowering one's magical workings for protection. It may also be used to increase protection magic while other magical work is being done therefore increasing the chances of a successful outcome for a spell, ritual, or other magical casting. It is suggested that the practitioner who utilizes this candle also inscribe some symbols, that correspond with the intention of the casting, into the candle prior to lighting it. The name of the person or persons the casting is to benefit would be one example of a symbol to carve into the side or base of the candle. This candle may also be anointed further with oils pertaining to the desired end result, however it is not required. This item was handcrafted in the USA.